The European Union's Brexit negotiator has said Theresa May should endorse a permanent customs union with the bloc - as proposed by the opposition Labour party - to break the impasse over their looming divorce. The British Prime Minister has said she wants further talks with the opposition on a Brexit deal. Last week Labour leader Jeremy Corbyn set out five conditions he wanted to see met before he would consider supporting Mrs May's Brexit plan. Michel Barnier told a news conference in Luxembourg that time was "extremely short" to conclude a deal before Britain is due to leave the bloc on 29 March. The EU is urging Mrs May to work with Mr Corbyn to unlock ratification of the Withdrawal Agreement she negotiated with Brussels. British MPs overwhelmingly rejected the deal, agreed in November, in a vote last month, leaving Britain on course for an abrupt Brexit with no transition period to minimise expected economic disruption. "I found Corbyn's letter interesting in tone and in content," Mr Barnier said of the Labour leader's Brexit proposals, sent to Mrs May. "Something has to give on the British side," he said. In a reply to Mr Corbyn published by Mrs May's office late yesterday, she rejected the idea of a customs union, saying Britain must be able to strike its own trade deals after Brexit. Mr Barnier said he understood Mrs May did not want to delay Brexit to win more negotiating time and reiterated the issue of the Irish backstop in Britain's stalled withdrawal agreement was an insurance policy the EU hoped never to use. "This time that remains is extremely short," Mr Barnier told the joint news conference with Luxembourg Prime Minister Xavier Bettel. "The Withdrawal Agreement which we agreed with Theresa May's government ... remains the best way to ensure an orderly withdrawal of the UK." Mr Barnier, who will meet Britain's Brexit Secretary Stephen Barclay in Brussels later today, said it was up to London to provide clarity on what next - a view shared by Mr Bettel. Meanwhile, the UK's Shadow Brexit Secretary has said the key question facing Mrs May is whether or not she is willing to move her red lines to find a consensus on Brexit. Speaking in Dublin, Keir Starmer said he does not see that movement in Mrs May's response to Mr Corbyn's five key demands from Brexit. Mr Starmer said the point of the exercise was to show Mrs May there is a majority for a close economic relationship with the EU if the prime minister is prepared to find it. He said that should be tested by having a vote on a customs union to see whether Mrs May is really interested in consensus, or whether she is just running down the clock. He said if she is just running the clock down then parliament needs to step in and say it is not going to accept that. 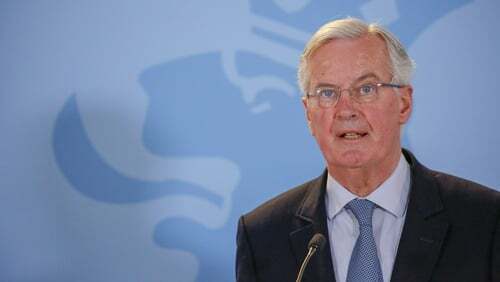 Mr Barnier reiterated the bloc would not return to talks on the legal withdrawal treaty but could tweak the accompanying political declaration on EU-UK ties after Brexit. Earlier, the Tánaiste said Ireland should not be taking sides between the Labour Party and the Conservatives when he was asked about Mr Corbyn's proposals. Ahead of his meeting tonight with Mr Starmer, the Tánaiste said that "with 46 days to go before Britain leaves the Union, what we want to see are the two large parties in Westminster working together to find a way of getting a consensus and a strong majority to provide certainty." Asked if he shared the view that Mrs May was just running down the clock, Mr Coveney said that is a matter for Westminster as a parliament, and for Mrs May who has to manage the politics of Brexit.